The Sorrento Financial - Michael White Bank Wealth Management Report is the first comprehensive source of national, standardized data and performance ratios that measure and benchmark the banking industry's performance in generating fee income from multi-faceted wealth management services. 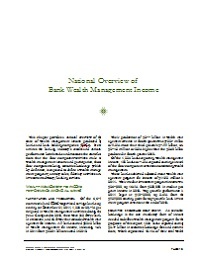 This report defines wealth management as the sum of four types of fee income: (1) trust or fiduciary-related revenues, (2) securities brokerage fees and commissions (broker), (3) investment advisory, banking and underwriting fees (dealer), and (4) annuity commissions and fee income, where the mandatory field that all banks must have to qualify as a wealth management program is securities brokerage income. Program Concentration reveals how concentrated or meaningful bank wealth management programs are among their banks’ nonlending activities. Program Penetration measures the amount of wealth management revenue generated per million dollars of core or retail deposits. Program Productivity measures the production of wealth management program income per bank employee. 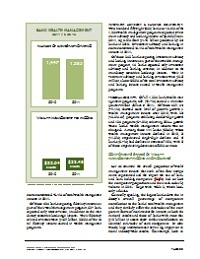 Program Density calculates the amount of wealth management program income per domestic banking office. 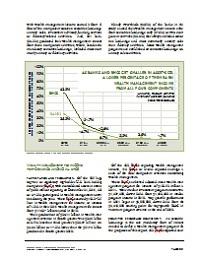 Program Contribution measures the contribution that wealth management’s fee income makes to bank net operating revenue. 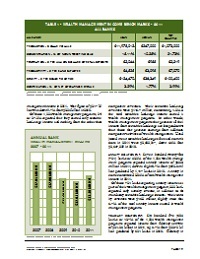 Program Growth tables rank the bank and BHC leaders in year-over-year growth in wealth management program income. Component Composition examines the proportion or extent to which each of the four income components (i.e., annuity income, fiduciary income, investment advisory and banking, and securities brokerage) contributes a share of wealth management. Market Share ranks the leading banks and bank holding companies in each asset class according to their percentage share of the bank wealth management market in that particular asset class. Concentration Ratio Growth ranks the leaders in growth in the ratio of wealth management income to overall noninterest income from one year to the next. 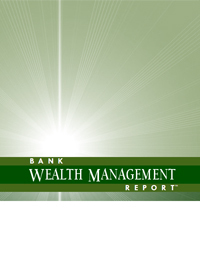 This report is approximately 110 pages in length and includes over 90 tables and graphics that measure, compare, rank and rate bank holding company wealth management performance measures annually and contrast them with those of the prior year. A comprehensive glossary defines key banking industry terminology. This report includes all mean, median and top-quartile benchmark measurements in comprehensive tables for each asset class. 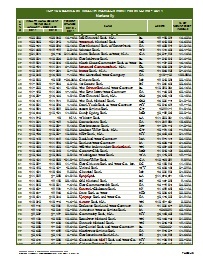 Tables list the top 50 bank holding company performers nationally in each benchmark of wealth management income. Similarly, we list the top 50 leaders in these benchmarks for institutions with assets over $10 billion, with assets between $1 billion and $10 billion, with assets between $500 million and $1 billion, and with assets less than $500 million. 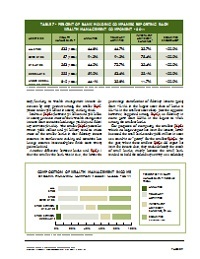 We also rank the top 50 leaders in six regions in wealth management income production. 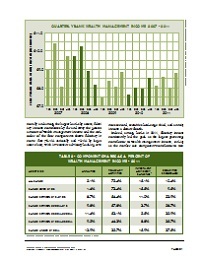 We rank the top 50 banks in wealth management income by asset class, too. Importantly, the data for the Sorrento Financial - Michael White Bank Wealth Management Report is not based on surveys, which themselves are dependent upon survey-response rates, survey reliability, or extrapolation of survey findings to a larger universe. The data for the Sorrento Financial - Michael White Bank Wealth Management Report are derived from regulatory filings made by all commercial banks, all FDIC-supervised savings banks, and all top-tier large bank holding companies.